ANAHEIM, Calif. (AP) — No goalie had played more NHL games this season without a shutout than Connor Hellebuyck, who was beginning to wonder why he couldn’t keep a clean sheet. The Winnipeg netminder finally got it in an important win for the Jets‘ playoff chase. Hellebuyck made 29 saves and Kyle Connor had a goal and an assist in the Jets’ fourth straight victory, 3-0 over the Anaheim Ducks on Wednesday night. Anaheim had won six of nine in a late-season surge before getting shut down by Hellebuyck in his 13th career shutout, but his first in 55 appearances this year. Laurent Brossoit was in net for the powerhouse Jets’ sole previous shutout victory of their 44-win season. Winnipeg is headed to the playoffs for the second straight season after making it just once — and then getting swept by a powerhouse Ducks team — in the franchise’s first six seasons up north. After a scoreless second, Connor extended the Jets’ lead when he deflected Tyler Myers‘ shot for his 29th goal. “They got a couple of lucky bounces on their goals, and we couldn’t find the back of the net,” Ducks assistant coach Marty Wilford said. NOTES: Jets D Joe Morrow returned from a 14-game absence with a lower-body injury apparently incurred during a fight with Colorado’s Matt Calvert. Morrow dropped the gloves with Anaheim’s Corey Perry in the second period of his first game back. 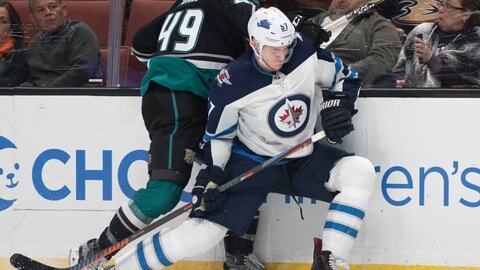 … Winnipeg D Nathan Beaulieu was scratched with an undisclosed injury, while C Jack Roslovic, who had a hat trick against Anaheim last month, returned after being a healthy scratch in the Jets’ last game. … Ducks C Ryan Kesler missed his seventh straight game with a hip injury. Anaheim D Andy Welinski stepped in for Jacob Larsson, who was scratched.